When he is not writing caustic pieces for the magazine, he plays the double-bass. Source: Kirill Lagutko. In Moscow, doing what you enjoy for a living is not as simple as one might think. There are often dozens of obstacles to overcome, as well as hundreds of financial, moral and creative issues to resolve. There is a draught. An old armchair sits in the holes of the dilapidated parquet floor; the cello leans against the window-sill and looks out through the slightly open window. Bows swing from the ceiling on thin fishing-line, echoing the excitement of the brightly colored dress that hangs on the wall. A cardboard cut-out of a man gazing intently stands in the corner, hiding a guitar and a dismantled drum kit. On the sofa, a tabby cat called Vatslav purrs and eats a piece of processed cheese. Coffee flows through the Turkish coffee maker. It is 5 a.m.; Chistoprudniy Boulevard awakes to the sound of tram wheels rattling along the rails and tired young people mumbling on a Saturday morning. Sasha is smoking. The exam session at the department of film-directing at the Boris Shchukin Theatre Institute has left Sasha completely sleep-deprived for a whole month. Every month, Moscow retains its status as one of the most expensive cities on the planet. For dinner, which swiftly turns into breakfast, Sasha buys herself a bottle of cheap wine, a piece of cheese and some coffee. Six years ago, at the age of 17 and having moved from her parents’ place to a rented apartment with course-mates, the student of theatre criticism at the Russian Academy of Theatre Arts never once imagined that she would someday be able to do what she loves for a living. After four unsuccessful attempts at entering the faculty of acting, she decided to enroll in the faculty of theatre studies, which is open to anyone who does not pass the audition. The door creaks open. There is no need for a lock on it, since nobody knows that people live here – and those who do realize that this is the case are always welcome guests. A blond young man stands at the door, tired after dragging his double-bass into the room. Lyosha, Sasha’s course-mate, writes a column entitled “At the Theatre with Aleksey Kiselyov” for the well-known Moscow magazine Afisha. 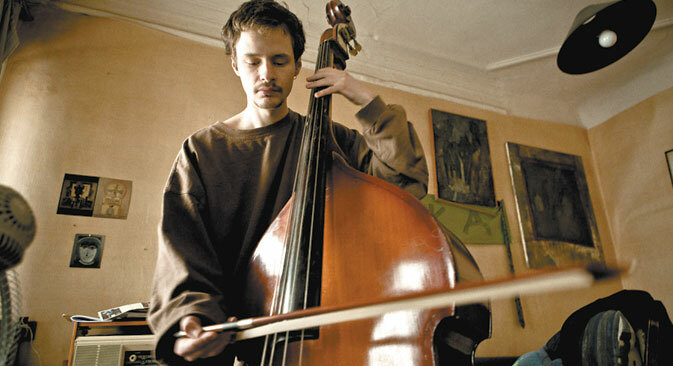 When he is not writing caustic pieces for the magazine, he plays the double-bass, composes experimental music and puts on shows when he feels especially melancholy. He does not have the same financial issues as Sasha: he has not paid rent since moving in with his girlfriend, in her father’s art studio. “We once found the transcript of an audio-recording of Putin, entitled ‘Prime Minister Vladimir Putin meets with the participants and organizers of “The Little Prince” music and literature charity event.’ The author of the text was unknown, and we decided to play around with it a little, through the medium of drama. “We named it after the recording, and tried to refrain from attaching any kind of political connotation; although, of course, this aspect is somewhat inherent. In our country, censorship isn’t a problem if you work as part of an independent collective. The only problem is financing, of course, as there aren’t any funds or governmental establishments which support these kinds of projects,” said Lyosha. Sasha attended acting auditions with perseverance and persistence, until she realized that she wanted to become a director. She got into the Shchukinskii Institute on her very first attempt. In order to pay for her first semester, she spent a year working the night shift in a bar and took part in a few theatre festivals, which were organized by her course-mates. Lengthy discussions with weary customers at the bar, working overtime and many sleepless nights all served to strengthen her character and teach her to handle strong alcohol: she now drinks only wine or whisky. Her friends in the department of theatre criticism allow themselves the occasional rum and coke, as well. Work at the Meyerhold Center starts at 1 p.m., which means Masha can sleep in at least until 11:00. Masha Starygina, who goes by the nickname “Maman” (“mommy”) does what she loves best for a living: taking care of theatre performances. In fact, she likes “taking care” of things in general. Masha works with Olya, a former classmate of hers at the faculty of theatre criticism. Olya’s boyfriend, Kostya, is a set designer who studied under Dmitry Krymov, one of the country’s leading teachers of scenography. At the moment, he is holding an exhibition of his work at Neglinnaya Theatre. Besides this, he takes part in certain projects, but there is not much permanent work. “Surviving exclusively on what you love doing is a difficult task for a young director and his actors. There are successful shows, which attract large audiences, but these are one-offs. To some extent, this is either due to production issues or government funding. Theatres on the whole have such modest funds, which tend to be allocated purely to staging the production – if there is even anything to be allocated. After spending their ‘golden years’ at the institute, students become used to the consistent flow of work, and as a result they feel ‘abandoned’ when they graduate as they don’t know how to earn a living in their field of expertise,” said Masha. Sasha has an idea: four people, a spotlight, monologues, minimalism and the rhetorical question: “Who am I, in actual fact?” In terms of synopsis, all performances are fairly similar, as are people’s stories throughout history. Katya met Sasha seven years ago, and at first glance, her story may seem very similar: she dropped out of journalism, applied to study acting and eventually chose directing. Apparently, thanks to her former training, she has a “journalistic approach” to her creative work. “In Russia you can put on a performance about practically anything,” said Katya. “This ‘everything’ is restricted to the limits of your own fears: poverty, failure, lack of understanding, loss of happiness, etc. Perhaps you can’t find a role to play, but nobody can stop you from putting on a performance…. The audience may not always understand me, but perhaps I just haven’t found the right ‘language’ to communicate in. I feel that the audience is capable of understanding anything. Katya lives in a huge communal flat, together with actors, artists and other young people who work in the cultural center at the Bulgakov Museum. For the time being, Katya has to sleep in the large bath, which stands in the middle of her room. Yet, her show “My Father” has travelled as far as Poland and Germany; although, even as the show’s director, Katya herself was unable travel with the show, as her visa was not ready in time. The flat has been allocated, free of charge, by owners of the cultural center, so that the young director does not need to pay for expensive accommodation in the center of Moscow. When she and Sasha put on a show about Bulgakov’s plays, they came up with various theatrical excursions and poetry evenings. Katya earns 7000 rubles (nearly $225) per month from extra work as a script-writer, costume designer, actress and teacher. However, when asked what she would not consider as a side-job, she proudly repeats “I am, quite simply, a director. In Moscow, doing what you enjoy for a living is not straightforward. Dozens of hurdles need to be overcome and hundreds of financial, moral and creative problems need to be resolved. One realizes how to handle these issues and simply accept that they will always exist alongside it all, whatever the situation – holding you back and at the same time motivating you. A young director can find inspiration in absolutely anything.